Water heater stopped working in the Bay Area? Tankless water heaters, traditional water heaters and commercial water heaters are our specialty anywhere in San Mateo or the Bay Area. Get a water heater plumber you can trust! Like any appliance in the home, water heaters have a suggested service life of about 8 to 12 years. The life expectancy of a water heater will vary based on location, quality of installation, water quality, and maintenance schedule. If you’re water heater stopped working, don’t worry. We’ll take care of it! If your water heater is more than 10 years old, leaks around the base of the tank, and/or works erratically or not at all, it’s probably time for replacement. However, before we begin the replacement process, we’ll make sure that an electrical problem, such as a blown fuse or tripped breaker, is not the reason for the water heater failing. Perhaps the most common problem connected with a water heater is water that isn’t as hot as you want it to be. This is usually caused by a faulty thermostat or a defective heating element. 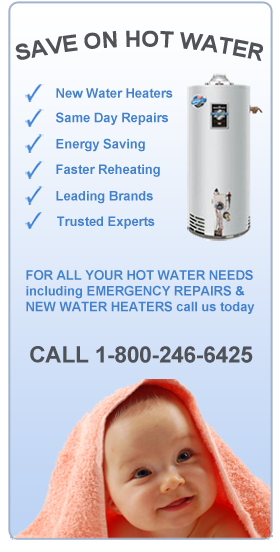 Why Call Our Plumbers for your Water Heater? Nobody likes it when the hot water stops! If you need an emergency water heater repair in San Mateo or surrounding areas, or a new water heater installation for you home, our experienced plumbers in the San Mateo area can help you with a flat rate, up front price and the minimum disruption to your busy schedule. We help hundreds of homes in San Mateo and throughout the Bay area get their hot water back up and running each year. It’s experience that shows when our reliable plumber arrives.